I worked from 7:30 until 12 without a break. At 2, I got a cramp in my hands and arms from peeling all of these tomatoes, and I started crying. I thought I was having a stroke, and I was dying. The chef was quite compassionate, he said, “Have you not had a break?” I said ‘No,’ so he gave me cup of tea and a sandwich. I was a long way from home, and I’d been catapulted out of my comfort zone. AOL Food: What drove you to so single-mindedly pursue winning three Michelin Stars? MPW: When I was at the Hotel St. George, I used to go to the porters’ office and polish the clients shoes with them. One day I saw there was a guide to restaurants and hotels, and I saw that restaurants had stars, and the finest restaurant in Britain was a little restaurant in Oakley — called the Box Tree — and it had two stars. It became a dream, and one day I plucked up the courage to contact the Box Tree for a job. It was like my life had changed from black-and-white to color. [The owners] spoke about these great restaurants of France, and I used to sit there listening to talk after service in the nighttime about the experiences they had, like a boy being told a story by a great storyteller. My dream started to grow. One day — many years ago now — I became the first British chef to win three stars. I turned my dream into reality. Winning three stars was the most exciting journey of my life. AOL Food: Yet you decided to give back your Michelin stars and walk away? 1. Continue working six days a week to be the king of my world, and retain my status. 2. Live a lie, and pretend I cook when I don’t, and question my integrity and everything I’ve worked for all my life. 3. Pluck up the courage from within and give back my stars, abdicate my position knowing that tomorrow, I’m unemployed and have no status. AOL Food: How did you spend your time once you’d left? MPW: When you go down that road, all your energy is going to your food. You become emotionally stunted. You don’t develop as a human being. So I went off fishing, hunting, shooting — doing all the things I’d dreamt of as a child. What I didn’t realize was that the more I invested in myself, the kinder I was to myself and the more I understood myself. One day I walked away from the rivers, the streams, the fields, the woods — and I knew who I was. AOL Food: Since then, what’s changed in the restaurant world? 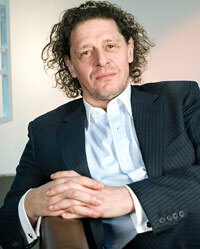 MPW: It’s about the chef, not the diner. I’ve always said the most poisonous source in any kitchen is a chef’s ego. Boys used to walk into the trade to learn their craft, not to be celebrities. Today there are very few chefs at that high level who are behind their stoves. You don’t feel their presence within the room. Where’s the romance? Where’s the show? Where’s the theater? The modern day restaurant — it’s like dining in a chapel. It’s boring. AOL Food: So which chefs are getting it right? MPW: Mario Batali. He’s very honest, very straightforward. [He] doesn’t pretend to be behind the stove. Mario sells you a night out with great food. There may be restaurants that are a little bit more technical than what he does, but I was in his new restaurant last night — delicious. It’s about eating. I’ve said many times, he is without doubt the gastronomic king of America. AOL Food: You’ve been a mentor to many chefs who have gone on to become celebrities. What did you share with them? MPW: Mario Batali and Heston Blumenthal — their first day in the kitchen was with myself. Gordon Ramsey came to me after catering college. I cannot teach anybody how to cook. All I can do is show them, share methods with them. With these individuals, I shared my dream, I shared my vision and they read off the same hymn sheet as myself. Look where they are today. They are boys with a dream. AOL Food: You acquired a reputation as a hot head in and out of the kitchen. Is that still a part of you? MPW: Did I shout? Yes. You have to shout in the kitchen to deliver the orders, to drive the troops, to get the food out. When you have a table of eight courses and everyone’s having something different, you have a 15-second window to get it all together so no one at the table waits. How many chefs when I was a young boy shouted at me during service? All I ever said was “Yes, chef.” The customer is the most important. If the chef overreacts, fine. At the end of service, you apologize. AOL Food: But what happens if it’s the customer who misbehaves? 1. If they are rude to my staff. No one has that right. If we make a mistake, allow us to rectify it. 2. If they are loud and abusive at the table. They have no regard or respect for the other diners, who may have worked very hard to save up their cash to afford your prices. On more than one occasion, I’ve asked customers to leave and I’ve walked back into the restaurant and gotten a round of applause from every table. You have to think of every diner, and those people spoil their night out. You have to have certain techniques to evict people well, and I’ve done it a lot. AOL Food: In the U.S., your protégé Gordon Ramsay hosts “Hell’s Kitchen” and is well known for his tirades. As the U.K. host, does your approach differ? MPW: Do I shout, belittle or swear? No. I have sufficient confidence within myself to control my environment just by my presence, just by working hard and leading from the front. I turned down “Hell’s Kitchen (UK)” five years ago because I wasn’t ready for TV. I didn’t understand myself well enough be an ambassador to my world, to inspire people to want to cook, to inspire young people to want to come into my industry. Gastronomy is the French Foreign Legion. You don’t need any qualifications. Just walk through the door and keep your head down. Be respectful — “Yes chef!” — and you’ll be given a trade. One day you’ll be in a position where you can put a roof over your children’s heads, you can put food on their table, create security for them.